At about the same time as I decided to launch this magazine I became aware of Reuben Sarkisian, an Armenian musician living in California. Listening to his breathtaking fiddle playing, I thought that here was a man about whom I would like to write. I little thought that I would be able to produce this small tribute to a remarkable man in my first issue. The bulk of the information is based on an interview conducted by Richard Spottswood in 1980 while the photographs and tentative discography come from Chris Strachwitz of Arhoolie Records. To both I offer my sincere thanks. Reuben Sarkisian was born around 1895 in Mazzira, Armenia (now known as Mamuret-el-Aziz in modern-day Turkey). 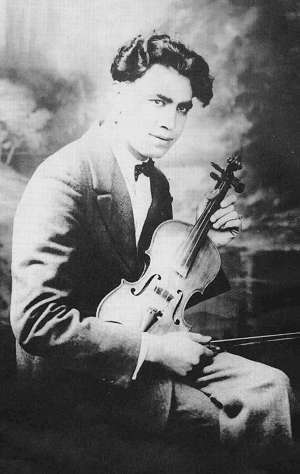 His father, a liquor store owner was himself a good violin player and encouraged Reuben at an early age. At the age of six he was invited to play for the dancing in the harems, organised by the Turkish community in Mazzira. Although there were many fine local musicians, both Armenian and Turkish, there were strict social codes governing entry into the harems to witness the dancing. The owners therefore had to bring three blind Armenian musicians living between 20 and 30 miles away, to play for the weddings and parties and Reuben, accepted because of his age, would accompany them on the tambourine. Although his sister and four brothers had been educated in Armenian schools, his father decided to place Reuben in a French Catholic school in Mazzira and by the time he emigrated to America he spoke French fluently. His elder sister had emigrated to Boston Massachusetts some years earlier and in 1911 she sent home enough money for Reuben to quit school and make the journey from Armenia. Although Mr. Sarkisian was understandably reluctant to talk of this period it must be mentioned that between 1909 and the close of the First World War the Young Turk movement was responsible for the massacre of up to one and a half million Armenians. Of those who escaped this genocide, many fled to the United States and in particular Boston, Fresno and Los Angeles. There is at present an active, dynamic community of over half a million Armenians living in America, but all carry the scars and tragic memories of this holocaust with them to this day. On his arrival in Boston, Reuben went to work in a shoe factory, but in his spare time he began playing the old tunes he knew on a mandolin, bought for him by his sister. He also developed, through the encouragement of a friend, a keen interest in photography - he was to keep up both hobbies for the rest of his life. In 1918 he was drafted into the Air Corps and having little English, was sent to New York to train, under French instructors, as an aerial photographer, at which he excelled. This opportunity to develop this career however was cut short when a fire at the air base left him with a serious back injury. His reluctance to undergo surgery left him hospitalised for 10 months and it was not until 1949 that he was finally cured at the Veterans' Hospital in Los Angeles. Upon his discharge he returned to Boston but without the capital required to set up as a photographer returned to his job in the shoe factory. While in the Air Corps he had been given some tuition on the mandolin, playing march tunes with the military band and gradually his confidence grew sufficiently for him to play both mandolin and oud at parties and socials organised by the local Armenian church. In 1920 he met and married his wife Vart (Vart being Armenian for 'Rose'). As Reuben explains, 'one day in Boston this young girl comes to my sister's house. I did not know her but she was from the same place back home as our family. She was my sister's husband's brother's daughter and my sister says to me 'Reuben, this is to be your wife'. I said 'what on earth do you mean? ' I already had a good girlfriend at the time. 'Nothing doing'. But gradually I learnt to like her songs and she learnt to like my playing (laughs)'. 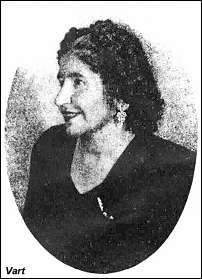 Vart was a fine singer of old-time Armenian folk songs and Reuben taught her many of the songs he had composed himself or learned from Armenian radio programmes and very soon she had joined his group as the featured singer. Among the other fine musicians in the group were a Mr Garbis (kanony) and Mr Melkon (oud), Reuben having taken up the violin shortly after his marriage. 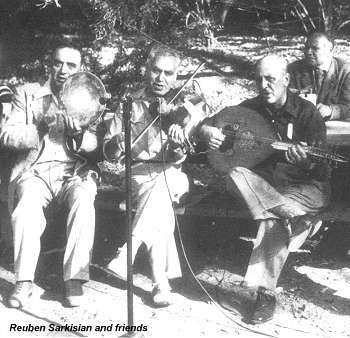 In 1947 his doctor, concerned about Reuben's back condition advised a warmer climate and the Sarkisian family moved to Fresno, California and it was not long before their musical talents were recognised by the city's large Armenian community. Encouraged by the regular requests for records, Vart set about finding the best way that this could be arranged. She invited the owner of an Armenian record store in Los Angeles to hear them play and he agreed to press the records if Reuben would handle their distribution. So in 1949 Reuben, Vart, John Berberian, H Parigian and J Elby crammed into a small back room of the store with violin, oud, banjo and dembeg (a small drum) while the recording was made in the next room. A total of 15 78rpm records were made over the next five years. 'We were practising all the time for the records. While I was working in the shoe factory I would be thinking all the time what record we would next be making. It was just a hobby - pretty hard work though! Once when Vart was in Chicago visiting our family I sat down and composed a song about my loneliness. When she returned we recorded it with our daughter Virginia and son Jack. Despite the musical excellence of the records and their popularity within the Armenian community, Reuben actually received very little from the sale of his records. He found the antics of some record store owners very distasteful - one falsely stating that all his copies had been broken on arrival and another claiming bankruptcy to avoid payment. At one stage the IRS became curious and investigated his accounts. Reuben was fined 5 cents and told not to bother them again! In 1955 however, he sadly called a halt to his recording venture and despite offers from other independent companies vowed never to record again. Fortunately though, he did not stop playing and although many of his former accompanists either died or retired, there were always younger musicians and enthusiasts wishing to listen to his 'Good Time Music'. Thanks in no small part to Richard Spottswood, researcher and champion of ethnic music in America, he appeared at several festivals and concerts in the 1970's and performed to much acclaim at the National Folk Festival at Wolf Trap, Washington in 1978. What shall I do? Where shall I go? Whom shall I see? Whom shall I tell? That I want a sweetheart like you. Yearning for me, her beloved.